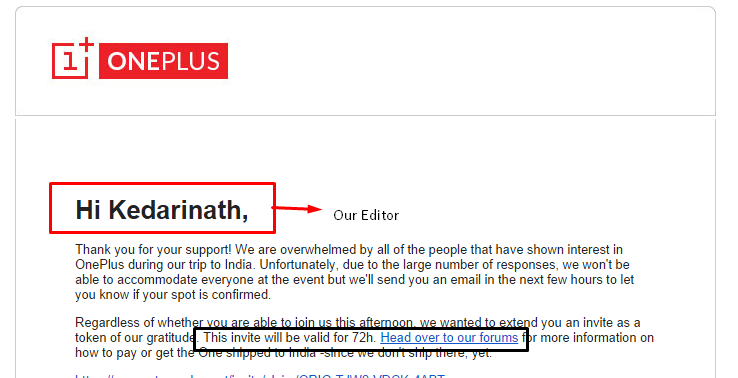 OnePlus One invite Giveaway time now before that go through First impression and Quick review of OnePlus One smartphone so you will know why it’s called 2014 Flagship killer, meanwhile we have seen huge response in the Facebook page of iGadgetsworld and thought of running a giveaway, so there will be one lucky winner to get the invite and the giveaway starts from today and with some coreasonable entries we will announce it tomorrow ! The year 2014 has been dominated by the likes of HTC One M8, Galaxy S5 and Nexus 5 and what not. 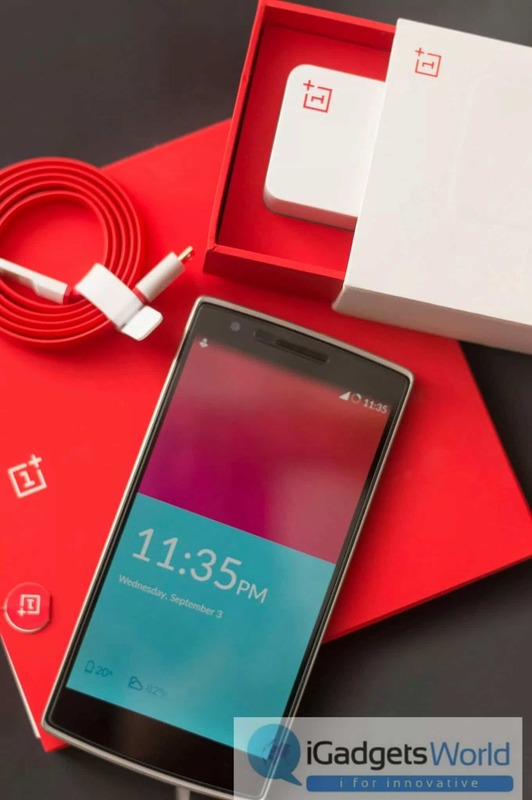 Come mid 2014 and the Oneplus One emerged. The packaging is extremely sophisticated and minimalistic. The pull out thread with the Oneplus logo used to break the rectangular box which houses the Oneplus outer cover made me feel like I am opening something valued. The outer white box had the specifications on the back and the one plus logo on the front and the red box inside jutted out the write with a nice pull tag on the side. The matte feel and finish of the red as well as the white box made it feel so sturdy and smooth. As you open the lid of the box you see the phone in front, beneath which were the accessories. The charger came in a separate box which had identical white and red color scheme and carried the same premium feel. The Oneplus came with a charger , a flat micro-usb data cable, a sim-ejection tool and nothing else. All of them carry the red color scheme. The screen of the One is massive and is beautiful. The edges are smooth and even though it is big, it fits nicely in my average sized hands. The metal bezel that goes all around the screen looks very neat. The screen seems to be raised of the bezel and gives an impression that its floating. The front has the earpiece and front camera and the capacitive buttons which are illuminated to just the right amount of intensity in a very unobtrusive way. On the left side are the volume rockers which are tactile but not very pronounced and you may need to be aware while locating them. The micro-sim card slot is also present which is nicely camouflaged and would only be generally located by seeing the sim-tray pin hole. The bottom houses the micro-usb port and a microphone and dual mono-speakers on either side. The right side has the power button which has the exact same feedback as the volume rockers and isn’t as pronounced either. The top has the standard 3.5mm headphone jack and another microphone. 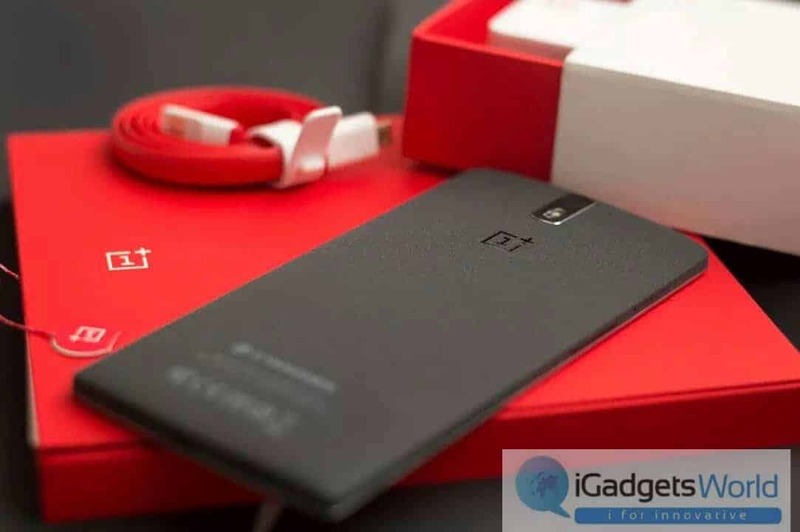 The back of the OnePlus One 64gb is one of its kind. The sandstone texture makes it so comfortable and secure to hold and feels like very soft sandpaper with the shiny oneplus logo and cyanogen logo below. It also has the 13mp primary camera with dual led flash and a third microphone behind. 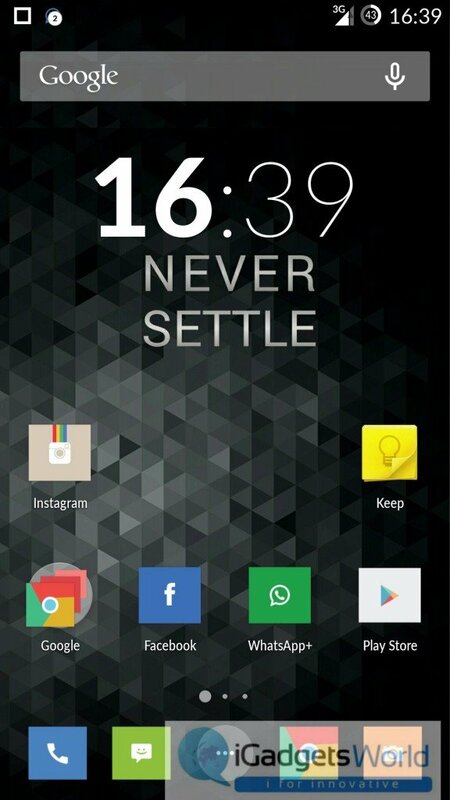 The Oneplus One is one of the most beautiful crafted mobile devices I have seen or held or felt in my hands. The sandstone back plays a major role. The edges are just slightly curved towards the center to give a very good grip. The Oneplus One is a powerhouse.Its powered by a Snapdragon 801 processor at 2.5Ghz with an Adreno 330 GPU. Comes with a 3GB RAM and 64GB storage. It blazed through apps with comfort. There wasn’t a time yet where it lagged or anything. Games run with no frame-rate drops whatsoever and give a good overall experience. Why wouldn’t they?! The 5.5″ 1080p LTPS touchscreen with corning gorilla glass 3 looks stunning! It has a 13MP back camera with dual led flash and a 5MP front camera. 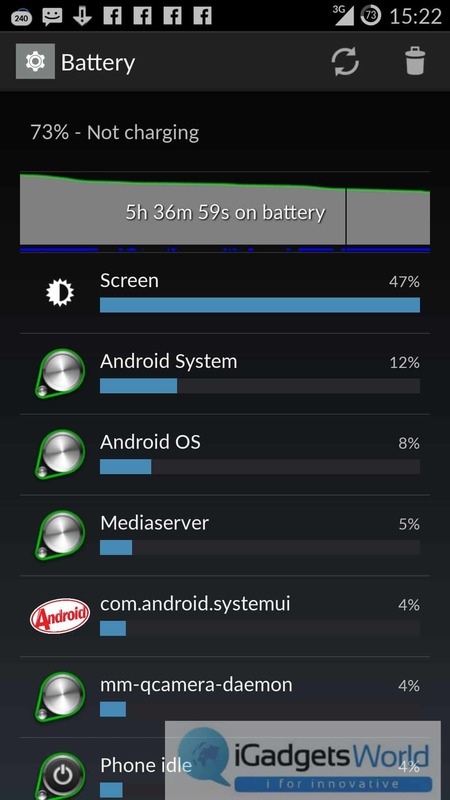 Cyanogen mod 11s is perhaps the most fun you can have with your phone without rooting it. The level of customization it offers right out of the box for an average user is insane. The lockscreen gestures like drawing a circle to go to camera or the drawing a v to toggle flashlight or drawing the music player symbols to control music are very useful as I find myself using all of these on a daily basis. Out of the box I received a system update which I have not done yet and I am on 24R right now. The camera is filled with features. Its reminiscent of googles stock camera but with cyanogen tweaks in it . The various live modes like smart scene , HDR , sepia , sports, night mode and many more are good for social networking on the go. The camera also offers metering and ISO control , burst mode and slow shutter up to 8 seconds. The camera pictures are sharp and pretty well saturated and definitely better than the nexus 5 or htc one m8. 720p at 60,30 fps, 1080p at 60,30 fps and also 4k Uhd and 4k DCI video capability. It also has a timelapse feature. 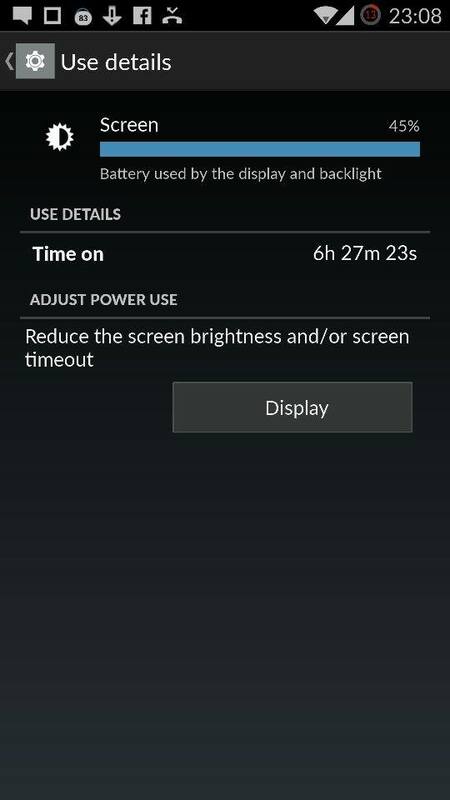 The 3100mah battery easily took me through the day with an hour or so of gaming and 3G on the whole time and using Facebook to check and respond to notifications and Whatsapp extensively and left me with 35% when I got home at night. There are a few minor bugs here and there like the flashlight gesture working with delay sometimes and the camera crashed when I switched to front camera which got fixed when I rebooted the one. Cyanogen developer support is one the sweet selling points of this phone which has already gotten rid of these bugs as I am yet to update my One. So is it a 2014 flagship killer? 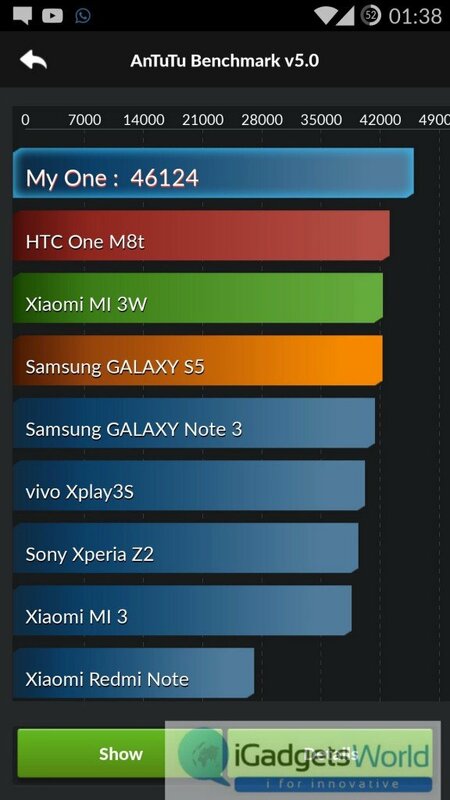 For me , all the specs of an 700-900$ smart phone at just 363$ with the amazing software and the beautiful premium build quality definitely make it so for now. But getting your hands on the phone is the bigger task since its being sold at an invite only basis. And even harder for Indians or other non listed countries as right now you would have to use a parcel forwarding service to buy it and get it shipped to your country. I shall see how it fares in the days to come. Stay tuned for the full usage review and the Unboxing video.